Love the knots! This years book has 32 pages, 16 if you do double spreads. Thanks for the comment! This is wonderful! What a creative idea to do the ropes and knots! I get so inspired by your blog! I am so enjoying your collection of knots. I really enjoy looking through your work. Such talent. How do you not get lost in these knots? These are gorgeous! I love the textures and compositions. They look so elegant. Have a nice weekend Debra. These all look delicious, I mean really like they are made out of spun sugar and I could just take a big bite. Lovely! Your knots are amazing, Debra! I am so lucky have one of them, an original(! ), here in my workroom! Cool lover's knots. Do you have a family member in the boy scouts? LOL! I remember my nephews having to learns knots. It's really fun to see you working on a subject and keep making different versions, every version is unique and yet still strongly connected to the subject. THanks for the comments Debra. Appreciate it! 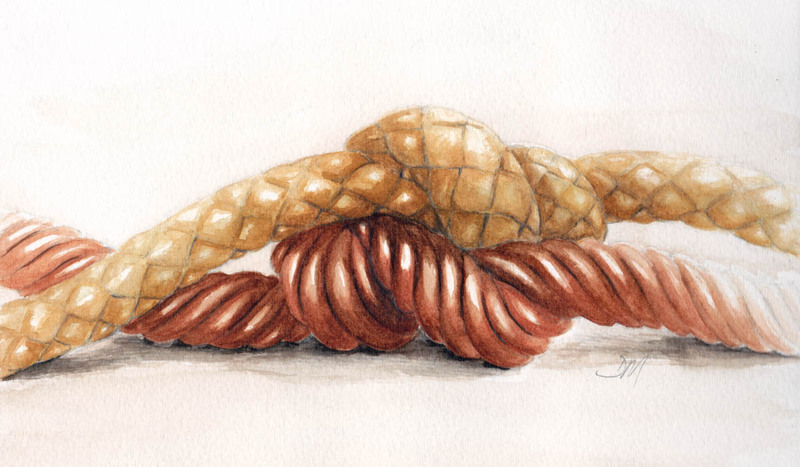 Your knot drawings are so lovely - what patience you have, to follow all those twisty fibres!